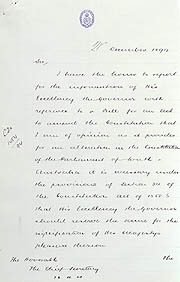 The documents shown are the Bill passed by the South Australian Parliament in 1894 to grant women the right to vote and stand for election in the Colony's Parliament, and a letter from the Attorney-General dated 21 December 1894 advising Governor Kintore that Royal Assent would be required to enact the Bill. 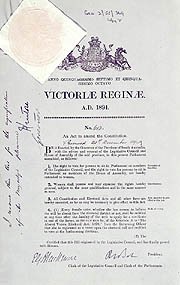 The Bill was enacted when Queen Victoria signed her Assent on 2 February 1895. These documents show that South Australian women won the vote in 1895, not 1894 as usually stated. They were the second to gain the vote, after New Zealand women who secured this right in 1893, and the first in the world to gain the right to stand for election. Thus Catherine Helen Spence's candidacy for election as a Federation Convention delegate was the first such in the world. The Act also had a more generous provision for absent voting by women than by men, in that women could get an automatic postal vote if they were more than three miles from the nearest polling booth or if they felt the state of their health prevented them from voting on the day. South Australia had granted voting rights in local government elections to women property owners in 1861. But it took eight attempts and another 30 years before the parliamentary franchise was extended to all adult females. After Private Members Bills had failed, the Government of Charles Cameron Kingston (who had originally opposed such a measure) adopted the proposals of the Women’s Suffrage League. They were carried, with a monster petition in favour of over 11 000 signatures influencing the course of the difficult debate. The postal voting provision had been included by opponents as an amendment to the Bill in the vain hope that the Government would not accept it and abandon the measure. 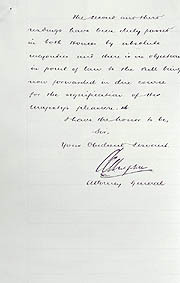 The annotation by Governor Kintore on the Bill states that the 'Act' is reserved to be signed by Her Majesty and he duly forwarded the Bill to the Marquess of Ripon at the Colonial Office on 26 December 1894. The Bill was placed before Queen Victoria at the Privy Council meeting at Osborne House on the Isle of Wight on 2 February 1895 and was signed into law. It was proclaimed to operate in South Australia from that date by gazettal on 21 March 1895. The signed Assent copy of the Act has not been located. Oldfield, Audrey, Women's Suffrage in Australia, Cambridge University Press, Melbourne, 1992. Parkin, A and Patience, A (eds), The Dunstan Decade, Longman Cheshire, Melbourne. Richards, Eric (ed. ), The Flinders History of South Australia: Social History, Wakefield Press, Adelaide, 1986. Detail from the title page showing the crest and part of the seal on the Constitution (Female Suffrage) Act 1895 (SA). 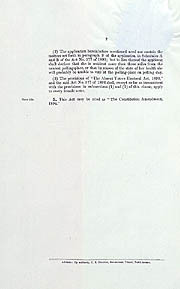 Long Title: A Bill for an Act to amend the Constitution (Female Suffrage) [No. 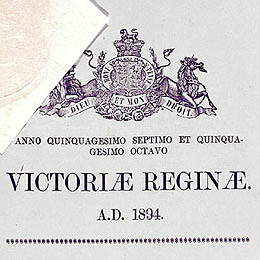 613 of 1894] Reserved for Royal Assent, granted 2 February 1895.